"There are no two words in the English language more harmfull than 'good job'." Whiplash is one of the most dramatically violent films of the year. The way writer/director Damien Chazelle uses jazz to express uncompromising creative artistry is exceptional. Miles Teller tempers his natural charisma to give a fluidly determined and sympathetic portrait of a young musician obsessively trying to master every aspect of playing the drums. His performance, in the face of J.K. Simmons as that of a tyrant and musical disciplinarian, is superb. Simmons' Fletcher is an unrelenting monster who pushes his students to terrible extremes. It's absolutely thrilling how Chazelle frames constant, repetitious scenes of jazz rehearsals to full effect, gaining pure drama out of playing jazz standards (im)perfectly. Its editor (Tom Cross) and cinematographer (Sharone Meir) know the language of music, cross-cutting and seamlessly switching from instruments and performances with verve and sophistication. The film's vision is bold and uncompromising, particularly in the final act, where a brutally affecting drumming scene is executed full throttle. We buy Teller's insane drumming abilities pushed to the limit by Simmons. It's an unbelievable high note that crescendos right at the climax, musically and dramatically. These moments of perceptive storytelling are so promising and inventive where the conventional drama and relationship support its momentum along. Chazelle shoots musical performances like action scenes with precision, jazzy flourishes, and an effortless style. Chazelel, Teller, and Simmons take drumming, jazz, and musical expression to its very limits in how its interpreted cinematically. Instruments and song standards are abused for every single beat. 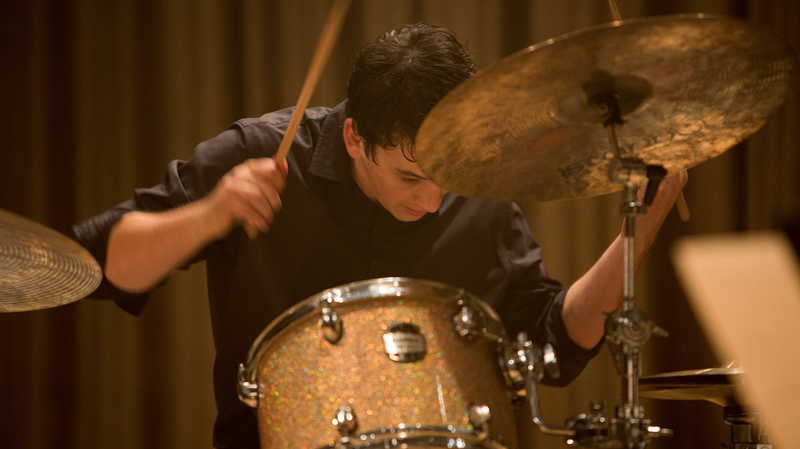 Whiplash is a film of extremes, suffering for your art, and the folly of reaching for greatness. It's a special film, uniquely filled with incredibly rich performances of both physicality, artistry, and emotion. Music and acting are taken to extreme places in a purely raw experience that's completely visceral and haunting. Whiplash screened at the closing gala of the 2014 Vancouver International Film Festival.